A Year in the Life: Ambient Math Wins the Race to the Top! Why ambient? A math teaching style that’s whole and all encompassing, with themes that repeat many times through the years, is most likely to be effective and successful. Today’s blog will focus on Kindergarten Standard 1, in Number and Operations in Base Ten. Note that the Common Core Standards will appear in blue, followed by an ambient translation. Work with numbers 11-19 to gain foundations for place value. 1. 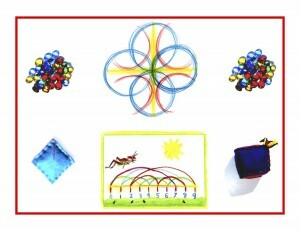 Compose and decompose numbers from 11 to 19 into ten ones and some further ones, e.g., by using objects or drawings, and record each composition or decomposition by a drawing or equation (e.g., 10 + 8 = 18; understand that these numbers are composed of ten ones and one, two, three, four, five, six, seven, eight, or nine ones. Foundational yes, but not yet explicit. Most of the Kindergarten day should be devoted to play. I say “devoted” quite consciously, meaning there’s a nimbus of devoted reverence around the work of play. Be sure to give it its due. I have a small picture on my desk of my daughter at 2, her first school picture. Though I was a stay-home mom, we thought the enrichment of having two mornings a week at a nursery school would be good. But her face in this picture is so sad, with eyes that seem to be begging to not be in school so soon. More and more research findings are showing that unstructured play until age 7 is best. Do encourage play with numbers! You might consider having a math corner, where the child(ren) can play freely with the materials you’ve introduced. Low-key guidance is also helpful and welcome here, ideally seamlessly blending learning and play. For this concept (place value through composing and decomposing numbers from 1-19) the glass jars and beans introduced on Day 4 will do nicely. Here is an excerpt from that post. The Math By Hand system uses beans for value coding ones, tens, and hundreds to teach place value in second grade. Black beans are ones, kidney beans are tens, and lima beans are hundreds. Without becoming too abstract, it may be possible to teach this standard’s concept using the beans. You’ll need black beans, kidney beans, and 20 small glass jars or clear plastic containers. For the first 10 jars, place 1 black bean in jar one, 2 in jar two, and so on up to 9 in jar nine. Place 1 kidney bean in jar ten, 1 kidney and 1 black bean in jar eleven, and so on up to jar nineteen. Place 2 kidney beans in jar twenty. No need to label the jars with their numbers, since the number of beans inside says which number each jar represents. This builds a wonderful foundation for understanding place value as well, without becoming too abstract. The jars demonstrate the concept, but composing and decomposing the numbers will need something different. A story would be nice here. Again borrowing from Beatrix Potter (who famously said that school would have hampered her storytelling talents) Squirrel Nutkin could help us with this concept. For the story props you’ll need 20 or so acorns and a closed cardboard tube. Cut a 2″ diameter hole in the middle of the tube and cover the surface. Glue actual tree bark to the tube or have the child(ren) color a piece of drawing paper with brown crayon for bark. Squirrel Nutkin’s tree could hold 10 acorns. Say, “Squirrel Nutkin had gathered 10 acorns into his tree, but he needed more for the long winter ahead. He was only able to find 1 more the next day, but wanted to wait until he had 19 before he added the new acorns to his store.” Then you could put different numbers of acorns next to the tree and ask how many does that number plus 10 equal. 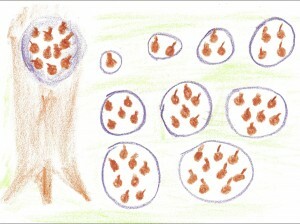 Do a guided drawing with the child(ren), showing the 10 acorns inside the tree plus different numbered piles of acorns next to it. 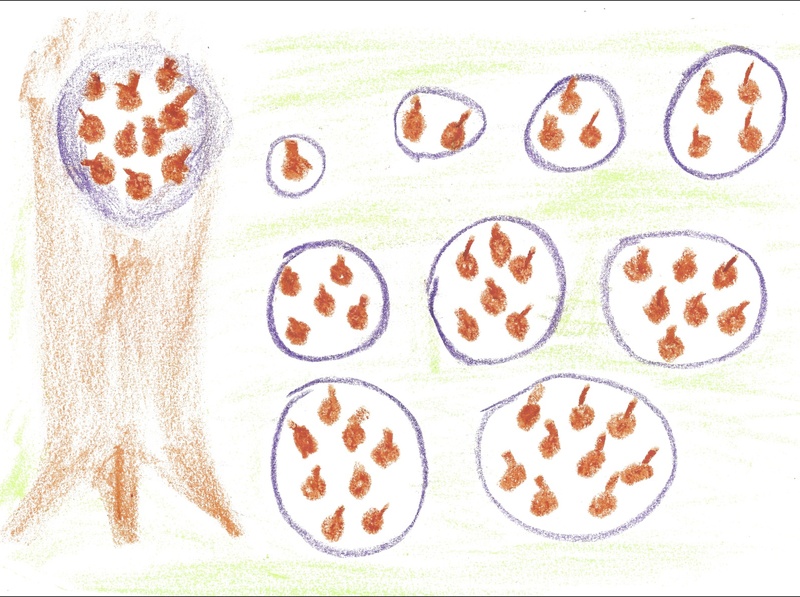 Have the child(ren) count out loud as they draw each group, saying “1, 2, 3, etc.” After the drawings are done and circled, count the acorns differently as the stems are added to the acorns: “1-10 then 11, 12, 13, etc.” No need to write the equations at this point, counting out loud should be enough. Knowledge ensues in an environment dedicated to imaginative, creative knowing, where student and teacher alike surrender to the ensuing of that knowledge as a worthy goal. More Kindergarten tomorrow! Homeschoolers Parents and Teachers. Get Your Free Weekly Newsletter. Homeschooling Tips For Fun, Faster Learning!